A long-established star of television and radio, Jennifer's personal style is usually a mix of low-key denim looks sprinkled with Irish designers on the red carpet, but for her hosting duties, she has embraced a more balanced look, thanks to the help of stylist Clémentine MacNiece. MacNiece has been working on the show, which films weekly at Ardmore Studios, since its first season, and has become an influencer all her own thanks to her behind the scenes insight into what it takes to put together looks for one of the most watched programmes on Irish television. Week after week, she put together options ranging from River Island mini-dresses to tiered dresses from Debenhams, each more captivating than the last. The collaboration between the two dates back to November, after Jen was confirmed as the replacement for Amanda Byram for the coveted hosting gig, and she and Clémentine began the lengthy process of understanding each other's creative style. "I’d never met Jen before, but of course I knew her. We met around November/December to have a quick chat of what she and I had in mind. After that, I went off and pulled about 40 outfits, then we had a huge try on session in December and I got a feel what she liked for the show," Clémentine told Independent.ie Style. "What's amazing with Jen is she's very open and willing to try everything, which is lovely in a person. She's willing to take a risk and step out of comfort zone. She's a breath of fresh air, which made it a very enjoyable process." "I think it’s nice to have something accessible, so people sitting at home and watching the show can say, 'I love this' and go onto ASOS to find it. "If you look at Strictly, Claudia Winkleman rocks loads of high street and affordable high end like Rixo London, which is something we were conscious about. There were some designer pieces in there - we did a Preen dress one night, but it was from the Designer Room in Dublin. So, yes, it was designer, but it was from a rental store." 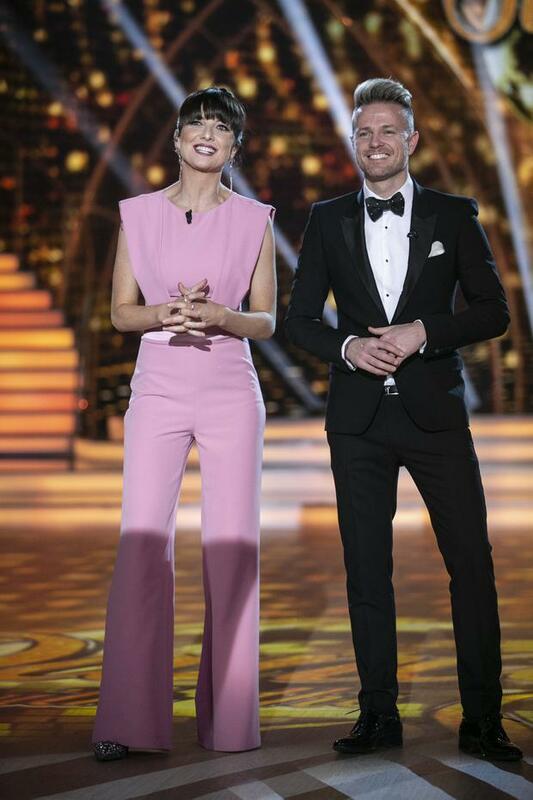 While Winkleman and her co-host Tess Daly take to the stage every Sunday in the BBC version of the show, Jennifer's outfit had to complement her co-host Nicky Byrne's choice of suiting. "With Nicky, it was about finding cool tuxedo looks and again, a lot of it was high street like Marks & Spencer. The key with him is tailoring. We had everything tailored to make it look more polished. A big part to make sure they matched each other. Sometimes we’d have to change Nicky to fit with Jen’s dress and vice versa." MacNiece also worked with judges Julian Benson, regularly commissioning Irish designer Claire Garvey, who also works with Nile Rodgers, for his colourful blazers, Brian Redmond's "dapper" tuxedos and Lorraine Barry dressed herself.